Picture a walnut. Now imagine the walnut is about the size of a cantaloupe. Add in wrinkles, and you have a visual of the human brain. Read on, to discover five more amazing facts. The human brain works faster than any computer. It takes more than 80,000 processors running on one of the world’s fastest supercomputers to complete one second of what the human brain is capable of. During that one second, the brain makes thousands of calculations. It monitors and controls all your bodily functions, and regenerates brain cells. It does all of this and still manages to generate up to 50,000 thoughts a day. Now that’s multitasking! The size of the brain doesn’t necessarily correlate to a person’s intelligence. If that were the case, an elephant would be smarter than a human because the elephant’s brain is almost four times larger. Scientists believe intelligence is related more to the connections the brain makes rather than its size. Each neuron in our brain is capable of making about 1,000 connections each second. With 100 billion neurons in our brain that makes a lot of connections! These neurons are also responsible for the brain’s total electrical output, which is 30-40 watts, enough to power a household light bulb. Albert Einstein’s brain weighed only two and a half pounds. 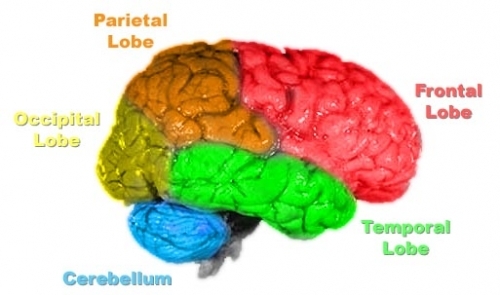 A portion of his brain between the temporal and parietal lobes (the part responsible for mathematics) was missing. Because this section was missing, it took less time for a neuron to travel between those two lobes, and his brain was able to make more connections than the average person. The ‘wrinkles’ we see on the brain are called convolutions. The rounded parts are gyri (pronounced: ˈjīrī), and the valleys are sulci (pronounced: suhl-sahy). Imagine folding a piece of paper back and forth accordion style. The area in between the folds (sulci) can hold more than if the paper were flat. These folds make for a shorter pathway so it takes less time for a neuron to travel and make a connection. We can also pack more neurons in between those folds, allowing it to function faster and more efficiently than if it were smooth. Your brain is 73% water. Water is necessary to make hormones and neurotransmitters. It also acts as a shock absorber for the brain and spinal cord. Your brain uses most of its water through exercise, waste elimination, and breathing. The brain can’t store water, so it has to be replaced regularly. Water is so important to the brain that your brain actually shrinks if you don’t drink enough. A dehydrated brain affects your energy levels, mood, and cognitive function. You may find that you get tired easily, become cranky, and maybe even confused. Your brain can’t feel pain because there are no pain receptors. This is why neurosurgeons can conduct brain surgery when a patient is awake. If there are no pain receptors why do people get headaches? Because there are pain receptors in the tissue surrounding the brain. In some situations, pain receptors in the tissue are activated either by releasing chemicals or increased blood flow, resulting in a headache.